It’s an endless pursuit for the runner. A search that never seems to end. Like the peak of an endless climb, the search for a rain shell that repeals the rain, weighs little, and doesn’t produce sauna conditions when worn seems endless. Oh, and doesn’t cost 200 dollars. Does such a jacket exist? Like the mysterious yeti, can the lightweight, affordable rainshell be located by the budget-conscious runner? Brooks believes they have provided the answer with their uniquely designed Cascadia Shell. Brooks sent this jacket to me back in the early fall, at a time with Alabama was in the midst of a massive drought. I didn’t get to test this shell in a race in rainy conditions until December. And it was put to the test in a big way at Pine Mountain Trail Race at FDR State Park, and around my neighborhood on a couple of rainy runs. Brooks offers a unique set of design innovations with the shell. 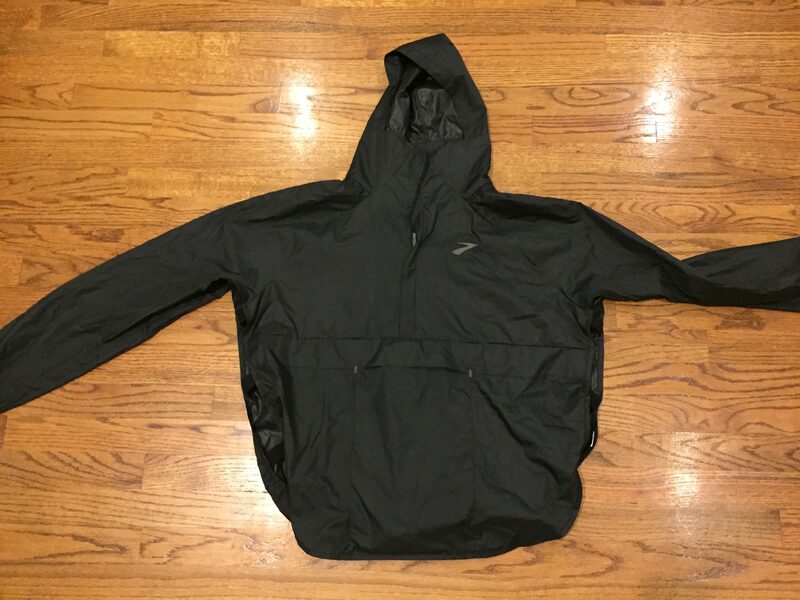 This is a pullover shell, a quarter zip adirondack-type jacket. It has a chest pocket just below the zipper, which comes in handy. The sidepanels of the shell are open with three pieces of elastic, each about 1.5 inches wide, which offers ventilation on warmer, rainy runs. The REI blog has the perfect description: think of a semi-fitted poncho with arms. The really cool design feature in this shell is the “hump” that’s built in to the back, which allows you to wear it over a hydration or day-pack. Too many rain shells require you to take the pack off to put the jacket on. Not the Cascadia Shell. The extra space in the back allows for a solid fit over the pack as opposed to trying to wear a conventional rain shell over a pack, making it feel like you’re being squeezed. I’ve worn this shell in light rain and heavy downpour. The Cascadia Shell is at its best in light to moderate rainfall. It sheds water and ventilates well. To be sure, this is not a waterproof jacket. It is water resistant, so light rain or misty days are perfect for this shell. At Pine Mountain the weather called for light rain for most of the day. Perfect, I thought, I’ll wear the Cascadia Shell and pack it away when the rain stops. The “light” rain turned into a monsoon and soon the Cascadia Shell soaked through. Here’s where the venting on the Cascadia Shell becomes a detriment. When the shell is soaked through, like most shells are apt to do in rainfall of Biblical proportions, the shell should block wind and keep in body heat. The venting on the shell, and the smock like design, prevent the storing of body heat and hasten cooling, which leads to a miserable experience. This was only a 19 mile trail race and I thought about dropping at mile 10 because I was so cold and wet. If I were to redesign this shell, I’d add sipper or velcro vent closures so that the venting could be managed. But overall, I love the design aggressiveness here. Not just another zip-up shell that doesn’t fit over a pack. Kudos to Brooks on thinking outside the norm.